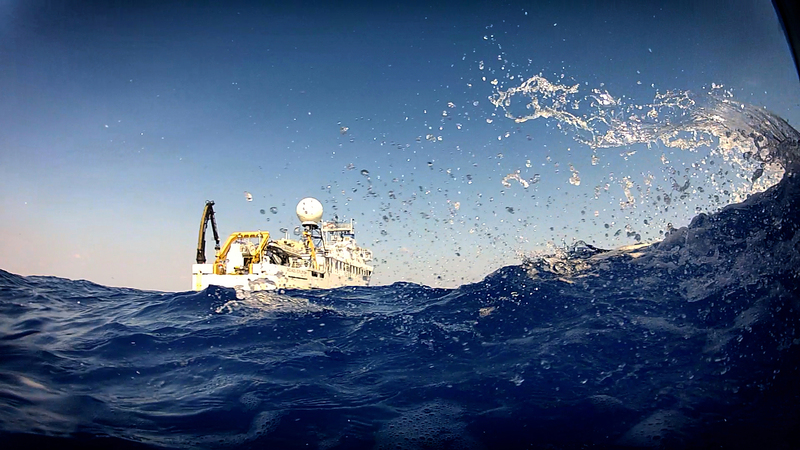 NOAA Ship Okeanos Explorer conducts operations in the Gulf of Mexico. During July and August 2013, Okeanos Explorer will conduct two telepresence-enabled ocean exploration cruises as part of the Northeast U.S. Canyons Expedition. Image courtesy of the NOAA Office of Ocean Exploration and Research. Download larger version (jpg, 1.5 MB). 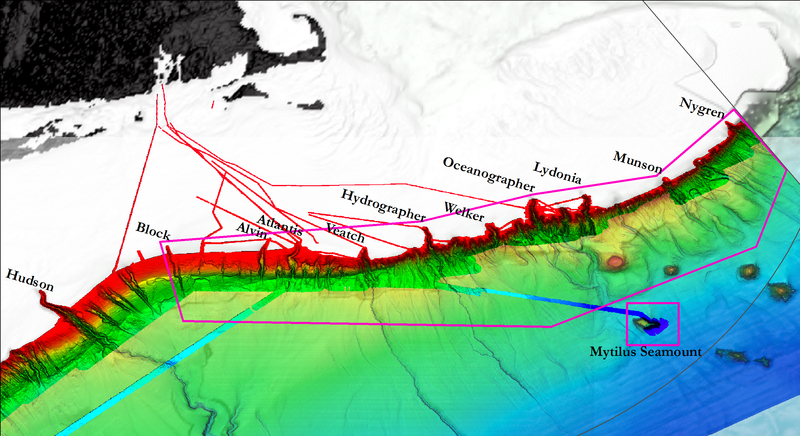 More than 100 nautical miles offshore of the northeast continental U.S., within U.S. territorial waters, submarine canyons cut into the continental margin, plunging from a hundred to thousands of meters deep, thereby connecting the upper continental shelf to the deep sea. Canyons represent some of the most striking features of the continental slope off the U.S. East Coast and may also be among the most productive areas in the deep sea. Submarine canyons are topographically and oceanographically complex, hosting specific sedimentological, geochemical, and hydrological characteristics that result in a high diversity of biological habitat types. Organic matter and nutrient-rich sediments are often concentrated in these areas and strong currents flow through steep and rugged terrain of the canyons, exposing hard substrates. These unique physical attributes of submarine canyons thus likely support and potentially concentrate a diversity of fauna, including deep-sea corals and commercially important fishes. With an increase in food availability and a variety of different habitat types across varying depths, it has been predicted that submarine canyons contain higher biodiversity and biomass than the adjacent continental slope. There are also places where hydrocarbon seepage occurs and failures on the continental slope can cause submarine landslides, which have the potential to generate tsunamis. Although scientists are beginning to study submarine canyons and seamounts on continental margins across the globe, our knowledge of the biological, ecological, and geological processes at present in the northeast U.S. canyon region is inadequate to provide a clear assessment of the geological dynamics, habitat diversity, and biodiversity. Coral and chemosynthetic communities represent some of the most diverse communities in the deep sea, yet scientists are just beginning to grasp their full extent in deep water. Cold-water corals, including stony corals, black corals, and sea fans, are important foundation species, providing habitat for numerous invertebrates and fishes, including commercially important species. Similarly, Bathymodiolus mussels, which can use chemosynthetic energy, serve as “ecosystem engineers,” altering the landscape to promote the colonization of other fauna. In the northeast U.S. canyons, recent investigations using remotely operated vehicles and tow-camera systems have revealed that these communities occur in these canyon systems, but the full extent of their distribution and community structure is still unknown. With increasing interest to locate U.S. continental energy resources, it is now critical to broaden our understanding of these communities, as many species are long-lived and slow-growing and thus vulnerable to human disturbances. Although considerable investigations of a few northeast U.S. canyons were conducted in the 1960s-80s, little work has been conducted in recent decades using the latest technologies. Many areas within this region remain completely unexplored, including seamounts within the U.S. Exclusive Economic Zone. Map showing submarine canyon and seamount areas expected to be explored during the Okeanos Explorer Northeast U.S. Canyons Expedition 2013. The operating areas encompass input from the NOAA Deep Sea Coral Research and Technology Program, NOAA Office of National Marine Sanctuaries, the Northeast Fisheries Management Council, Northeast Regional Council on the Ocean, Mid-Atlantic Regional Council on the Ocean states, and the U.S. Geological Survey. The grey line is the U.S. Exclusive Economic Zone. Underlying seafloor bathymetry shows the northern portion of the U.S. continental margin to the abyss with shallow areas in red to the deepest areas shown in blue. Bathymetry data acquired during surveys conducted from 2004-2013. Image courtesy of NOAA Okeanos Explorer Program (2011-2013 surveys), Sandwell and Smith (1997), UNH CCOM (2004-2012 surveys). Download larger version (jpg, 2.7 MB). During July and August 2013, the NOAA Ship Okeanos Explorer will work with the ocean science community to systematically explore the northeast U.S. canyons and Mytilus Seamount, one of the easternmost seamounts along the New England Seamount Chain. During these missions, we will collect critical data and information for the science and management communities, specifically targeting areas where both cold seep and coral communities are likely to occur. Furthermore, we will survey physical and oceanographic features, including where potential landslides may have occurred or will likely occur, to further our understanding of the diverse and dynamic geology and oceanography of the region. Increasing baseline knowledge while discovering new habitats will ultimately benefit the conservation and preservation of these remarkable ecosystems. The need to learn more about these relatively undisturbed ecosystems is becoming more urgent, particularly as fishing practices, mining activities, and hydrocarbon exploration extend into the deep sea. From July to August 2013, a team of scientists and technicians both at sea and on shore will conduct exploratory investigations on the diversity and distribution of deep-sea habitats and features in and along the Northeast U.S. Canyons and Mytilus Seamount. We expect to have a live-Internet connection to allow the world public to ‘join’ the team in making real-time discoveries from hundreds to thousands of meters below the ocean surface. The 36-day expedition is divided into two ‘legs’ that will both focus on exploring the seafloor habitats of submarine canyons and inter-canyon areas from Block Canyon northeast along the continental margin to the border of the U.S./Canada Exclusive Economic Zone. NOAA Ship Okeanos Explorer is one of the newest additions to the NOAA fleet and was commissioned in 2008. It provides accommodations for up to 46 crew and technicians. Unique to this ship, however, is that most of the scientists participating in the expedition will remain ashore. Via telepresence, live images from the seafloor and other science data will flow over satellite and high-speed Internet pathways to scientists standing watches in Exploration Command Centers (ECCs) and at other shore-based locations. During this expedition, a subset of core scientists will participate in the expedition from distributed locations including the Inner Space Center at the University of Rhode Island, Silver Spring ECC in Maryland, and the University of New Hampshire ECC. Through advances in the reach of telepresence, our 2013 expedition is showing increasingly distributed participation of ‘core’ science team members working from a number of other remote locations including Woods Hole, Massachusetts; Charleston, South Carolina; Philadelphia, Pennsylvania; Wilmington, North Carolina; Beaufort, North Carolina; Washington, DC; Baton Rouge, Louisiana; Gainesville, Florida; Tallahassee, Florida; and even the French Research Institute for Exploitation of the Sea in France. These scientists, and others on call if a discovery is made at sea, will add their expertise in real-time to operations at sea. One of the hallmarks of this expedition will be the high-definition video provided from OER’s new Deep Discoverer remotely operated vehicle (ROV) and Seirios camera platform. When deployed from the Okeanos Explorer, Deep Discoverer and Seirios will provide scientists and the audiences onshore with the very first video footage from many of the deepwater areas in along the Northeast U.S. Canyons and Mytilus Seamount. All expedition participants are anxious to see the spectacular habitats and marine life we’ll discover. 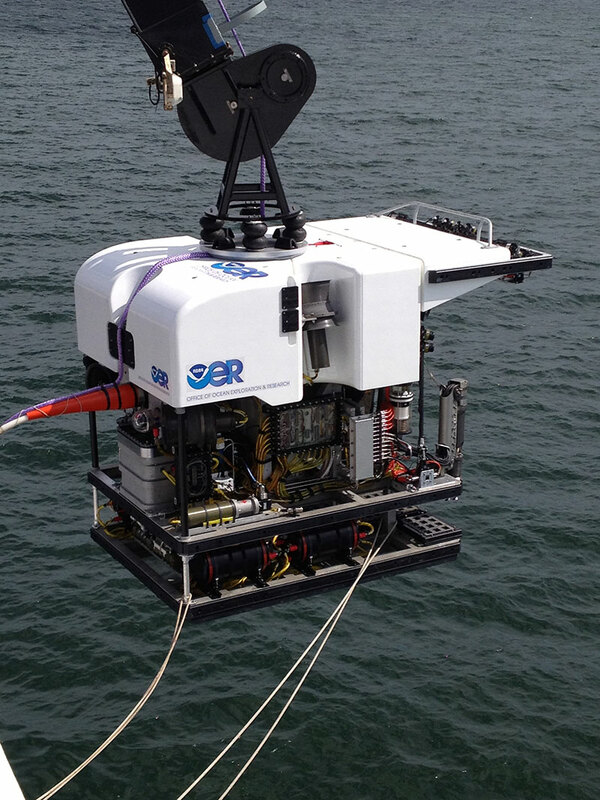 The Office of Ocean Exploration and Research’s new 6,000-meter-rated Deep Discoverer remotely operated vehicle (ROV) was brought online for engineering trials this past May, and will be used in a telepresence-enabled ocean exploration for the first time during the Northeast U.S. Canyons Expedition. The ROV was named after the retired NOAA Ship Discoverer that operated in the Arctic, Antarctic, Pacific, and Atlantic basins and conducted surveys and research ranging from undersea vents to aerosol characterization, leaving a vast and wide legacy including data that continues to be used by scientists today. Similarly, Deep Discoverer is expected to go places others have not and provide a legacy of data that will provide value to the science and management communities by doing what it does best – making discoveries. Image courtesy of the NOAA Office of Ocean Exploration and Research. Download larger version (jpg, 2.9 MB). This expedition provides unique and extensive opportunities to educators, students, and the public, bringing expedition-based materials and experiences directly into classrooms and to their fingertips. The webpages for this expedition include background essays; mission logs; daily updates; videos and images; near real-time ship tracking features; and a live feed over the Internet. An Expedition Educational Module provides products specifically tied to the expedition, including: standards-based lesson plans, a highlight video from one of the scientists participating in the expedition, background information, ocean career connections, and more. The Expedition Education Module also includes links to previous OER-sponsored expeditions in the region and their associated lesson plans. An "Ask an Explorer" feature on the expedition website provides opportunity for students and educators to submit questions to, and receive answers from, the explorers during the expedition. NOAA organizations participating in this expedition include the Office of Ocean Exploration and Research, Office of Marine and Aviation Operations, National Marine Fisheries Service, Office of Habitat Conservation, Deep-Sea Coral Research and Technology Program, Northeast Fisheries Science Center, Office of Coast Survey, Office of National Marine Sanctuaries, National Centers for Coastal Ocean Science, Center for Tsunami Research, National Coastal Data Development Center, and the NOAA Operational Systems Network. External partners in this expedition include the U.S. Geological Survey, New England Fisheries Management Council, Northeast Regional Ocean Council, Mid-Atlantic Fisheries Management Council, Mid-Atlantic Regional Council on the Ocean, Bureau of Ocean Energy Management, Smithsonian Institution, IFREMER, The Nature Conservancy, Louisiana State University, Florida Atlantic University, University of New Hampshire, University of Texas at Austin, Texas A&M University, Pennsylvania State University, Temple University, Woods Hole Oceanographic Institution, College of Charleston, University of Rhode Island, University of Connecticut, NOVA Southeastern University, University of North Carolina, Wilmington, Florida State University, Duke University, Harbor Branch Oceanographic Institution, University of Oregon, Allegheny College, University of Oregon, JHT, Inc., and Joint Office for Science Support of the University Corporation for Atmospheric Research.